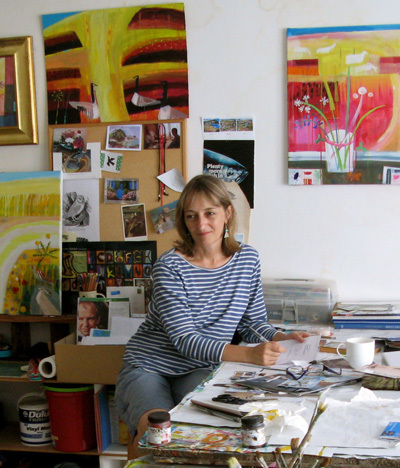 Mary Sumner was born in rural Northamptonshire and was schooled locally before studying at Northampton School of Art and West Surrey School of Art and then later at Bristol University. Mary was well known and widely exhibited in the South-West. After producing decorative textiles for a number of years Mary returned to painting and printmaking. Much of her paintings and prints were based on the Mid-Devon landscape around Tiverton, her home for over 20 years. Sketched observations on her daily walks provide much of the inspiration for her pictures; farm landscapes, birdlife and life along the Grand Western Canal as well as the seascapes of the South-West. Over time Marys style evolved to capture glimpsed moments and moods of the ever-changing English countryside, coastal towns, rolling hills and animals going about their business. To produce detailed and intensely coloured pictures.